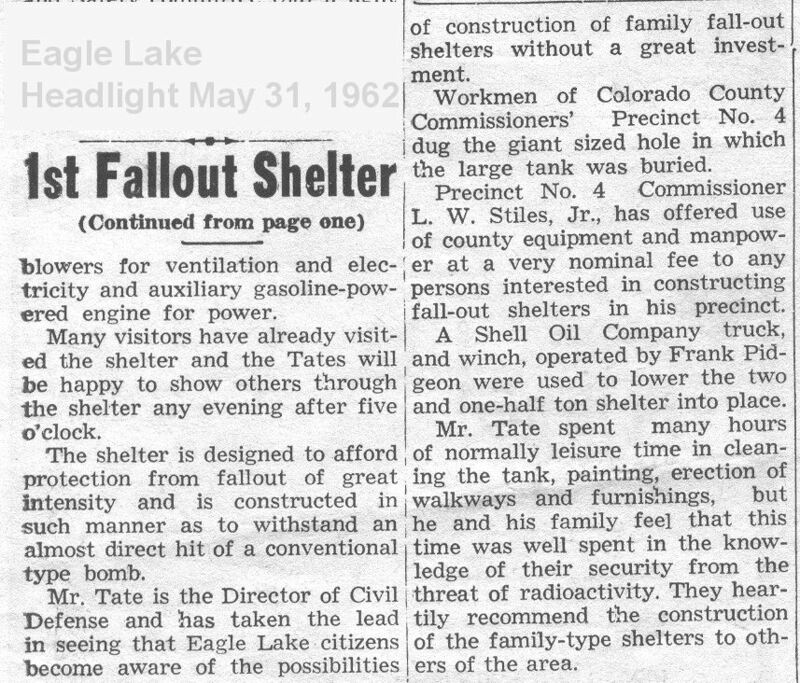 In November 2003 Chris Harris sent me scans of an article about his grandparent's fallout shelter. Here are a couple of his e-mail comments about the article. 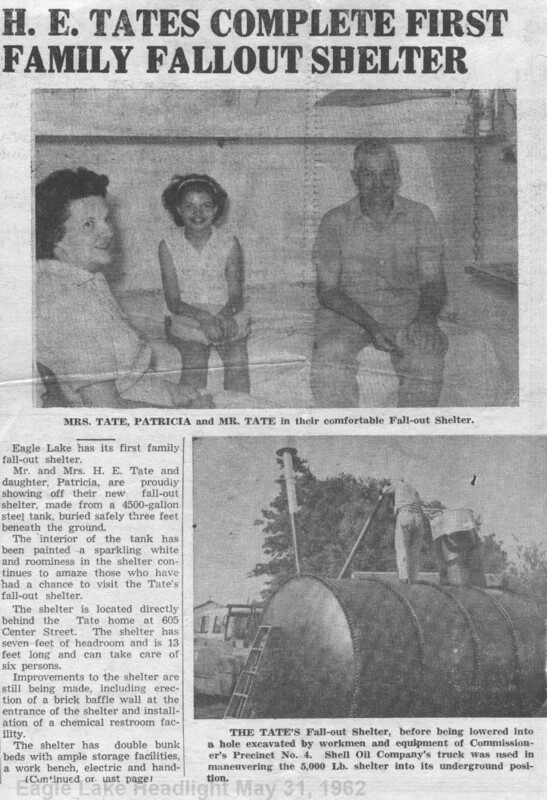 I have attached an article about my grandparents' fallout shelter in Eagle Lake, Texas. The picture was taken about the summer of 1962. My mother, Patricia, is in the picture with my grandparents. 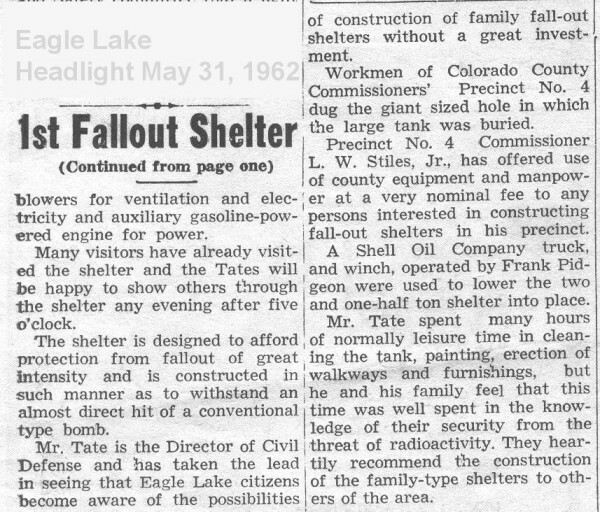 My grandfather (deceased) was Civil Defense Director in Colorado County for several decades. The fallout shelter is still in my grandmother's backyard and is accessible. I have attached the one article in two attachments. We have enjoyed looking at the CD Museum site. The article was from the Eagle Lake Headlight. My 90-year old Grandmother will be so impressed to see her picture on the web site. My grandfather was Civil Defense Director then Emergency Prepardness Official then Emergency Management Director in Eagle Lake from 1949-1984, so I have several odds and ends I will try to scan and send to you. Use whatever would be added benefit to the site...hope I can help. Thanks Chris for sending this article! !